Heat the oil in a large heavy pot and add the flour. Cook the roux, stirring constantly, to a dark, almost milk chocolate color. Just before the roux reaches the proper color, add the vegetables and stir very briskly, being careful not to burn it. If it burns, the roux is ruined, and you have to start all over again! When the vegetables are tender, add the stock, salt, and peppers. Stir until the roux is dissolved, and simmer over low heat for one hour. Add the shrimp about 5 minutes before serving, then add the crabmeat by the handful. Cook over low heat just until the shrimp turn pink and the crabmeat is warmed through. 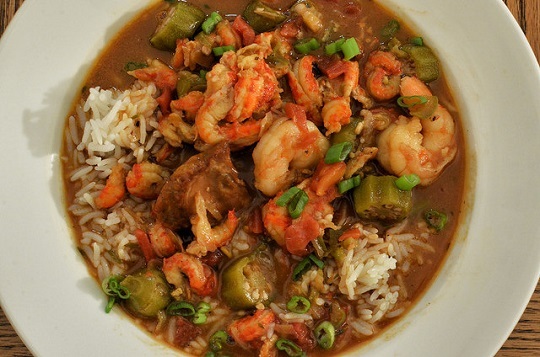 Serve in large soup or gumbo bowls over about 1/2 cup of cooked rice per serving.